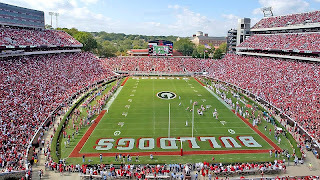 They told me that the UGA sections are "S" and "R" (see seating chart below). 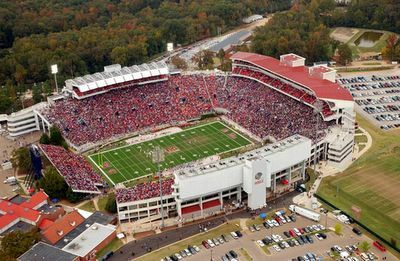 If you get smaller groups of tickets such as 2 or 4 together, they may be able to get you closer to the UGA section. If you want 6 or 8 together, they may place you in Sections J or K (which is pretty far from the Ole Miss student section). The stadium is so small that there's really not a bad seat in the joint. ALSO - they aren't doing seat allocations over the phone. They are just taking orders and doing the allocations shortly. Best of luck to you. When/if they sellout, let me know via the comments section. That said, there are roughly 5,000 tickets available for the game according to the guy I talked with. You're a lifesaver man! Thanks! just got 2 tickets for my first UGA game in 2 years, since moving to razorback country! Go DAWGS! This comment is buried by now, but on this topic, does anyone know of a bus or shuttle from Tunica to Oxford for the game? The Alum Assn referred me to Total Sports Travel, but they are booked. Is there any chance of the game being televised? My dad is a big GA. fan and I am taking him to Pawley's Island this weekend. Any possibility of any of the Charleston stations carrying the game? the 2007 game will not be televised. the link you clicked on is for the 2006 game.